You’ve probably heard a thing or two about the new Starbucks Planners 2016 coming this November 2, 2015 from your favorite blogs (ehem* cough*) and have seen its photos on social media. 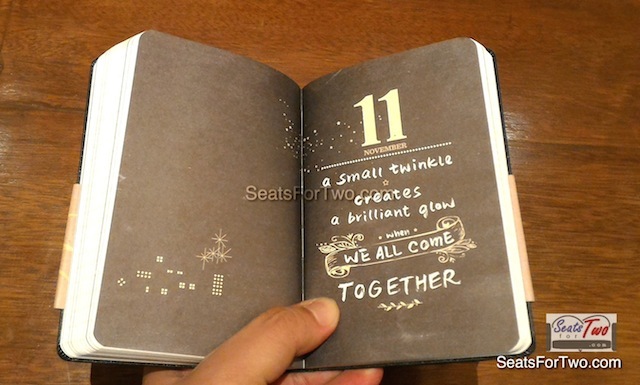 But perhaps, these 12 things about the most anticipated planner in the Philippines might tickle your fancy a bit more. 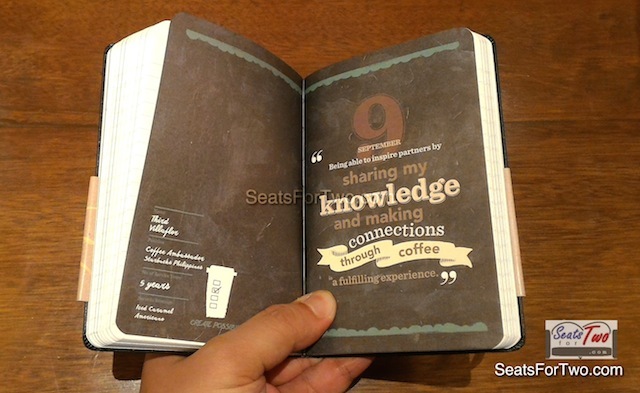 This is the first Starbucks Philippines Planner done with a collaboration. 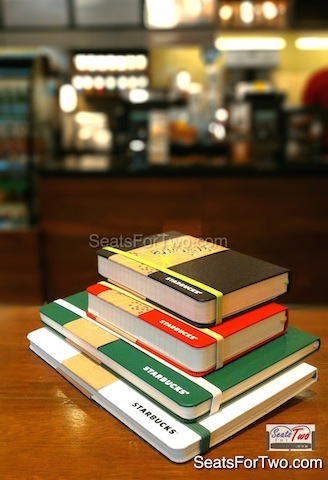 Starbucks partnered with legendary Moleskine to create the Limited Edition Starbucks by Moleskine 2016 planner. 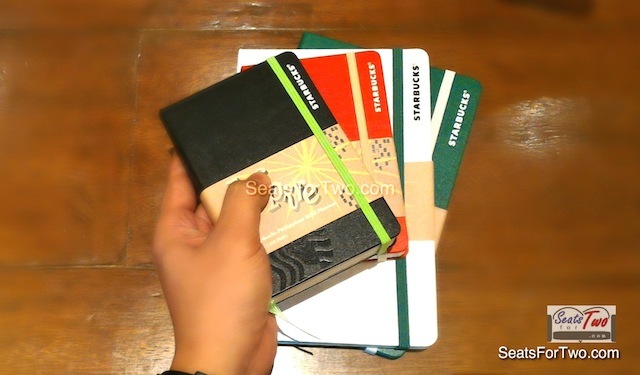 The 4 colours of the Starbucks Planners 2016 are White, Green, Black, and Red. The first three are standard Starbucks colours while the last one, Red, is for Christmas. 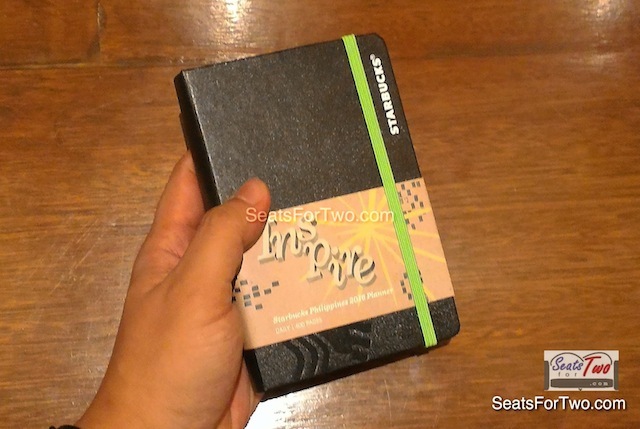 This is the first Starbucks Planner to come in two sizes! The idea was to address women’s concern who wants to put small planners into their bags. 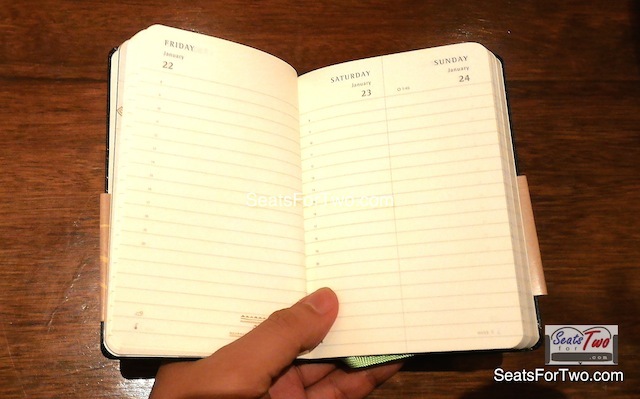 One of the major differences of the big and small planners is that the big one incorporates a weekly planner format while the small one, a daily planner format. I got the big one since I want to see my whole week laid out for scheduling while wifey got the small one so she can carry it anywhere. 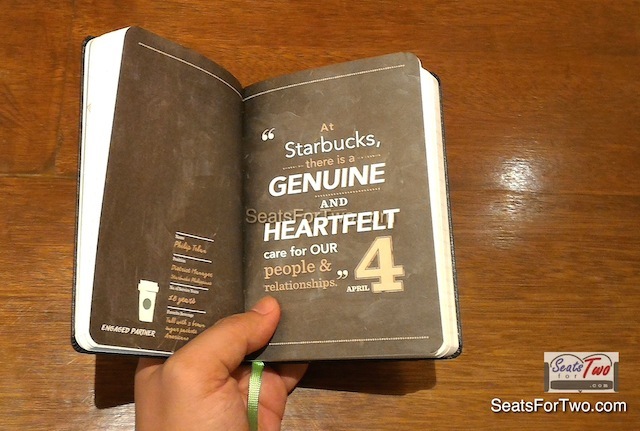 This is the first time the Starbucks Philippines planners will benefit 2 NGOs at the onset. 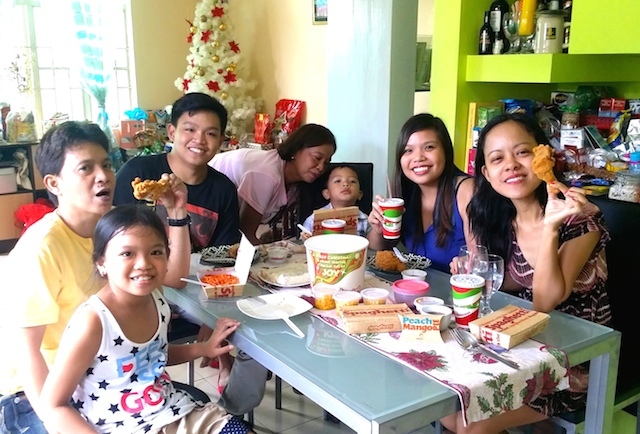 You’ll get to help non-profit organizations Teach For The Philippines (TFP) and the Philippine Educational Theater Association (PETA) to fund their advocacies. All layout style and fonts are Moleskine standard with matching acid-free paper subjected to rigorous quality controls to ensure every detail is preserved. This resulted into a good balance-mix of both Starbucks and Moleskine brands. The colours are standard Moleskine colours while the bands were specifically chosen to complement the cover hues. 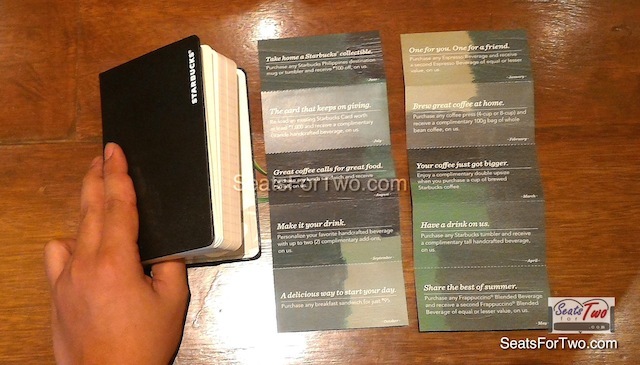 To avail of one (1) Limited Edition Starbucks Coffee 2016 Planner, a customer must accumulate a total of eighteen (18) stickers (9 holiday + 9 core beverages), to redeem. This is the same as last year’s! Moreover, you can combine up to two (2) promo cards; provided that the 9 featured plus 9 core beverages have been purchased. 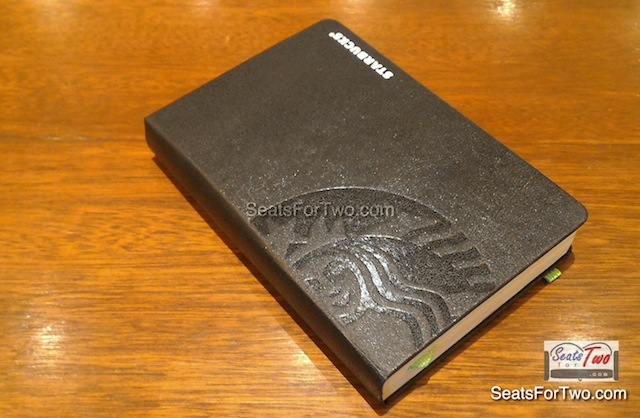 A total of 18 stickers to get the Moleskine Starbucks Planner! As an added treat, Starbucks custmers get a 1st-day free sticker / stamp on their 2016 Starbucks Planner Card / booklet. Furthermore, using a Starbucks Card will give you both (1) sticker and one (1) Beverage Star so it’s best to use one for the double benefit! Use a Starbucks Card to get both a STICKER and a STAR! 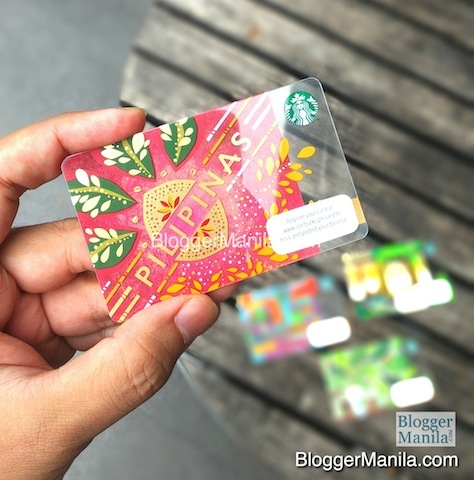 A single receipt bulk purchase of food and other retail items (merchandise, whole bean, Starbucks VIA) worth at least Php 7,000 will also get you a 2016 Starbucks Planner in the Philippines! For the older folks, your Senior Citizen discount are still applicable on your purchase, and you also get the stickers! It seems that I’ll be bringing grandma more often to Starbucks! Stickers may be obtained in any Starbucks Philippines stores from November 2, 2015 to January 7, 2016. On the other hand, redemption of the Starbucks Coffee 2016 Planner will be until March 7, 2016. And lastly, this is the 12th edition Starbucks 2016 Planner which started in 2005! To make it more special, the planner incorporated a “super-graphic logo”, meaning it’s a cut (not full) logo for the extra elegant impact. Follow our couple adventures through Seats For Two by subscribing to our blog through email and liking the Seats For Two Facebook Page. Follow our Twitter and Instagram account too! 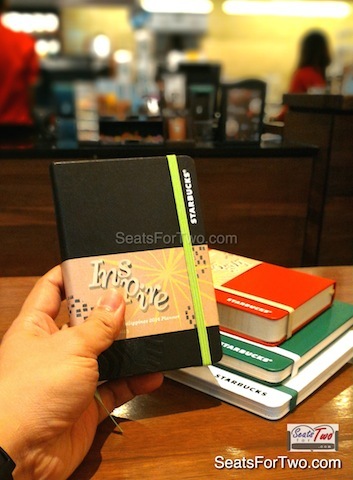 What can you say about the new limited edition Starbucks Planners 2016 in the Philippines? Are going for the big or the small one? Which color are you getting? 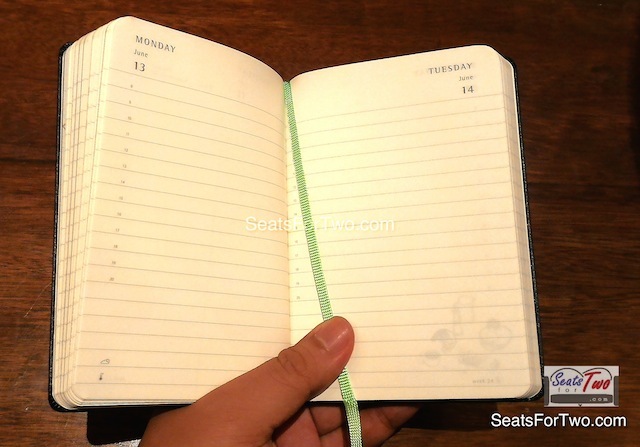 Wow Moleskin and Starbucks Planners in one! So does that mean you can get a free sticker without purchasing anything on Nov. 2 or would you get an additional sticker (meaning you get two) if you purchase a beverage? You are right Jules. Buy 1 Starbucks beverage today and get 2 stamps/stickers because your stamp card automatically has 1 free stamp. Thanks for the heads up! I got my card yesterday with the free stamp. Hi. I actually got the starbucks card for the planner with 1 free stamp. But I notice that it is not actually a sticker itself but it was printed/embedded on the card. Is it authentic. And can I avail it also until march 7, 2016?